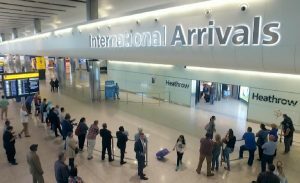 A few days ago, I found myself supping coffee and watching the goings-on inside Heathrow Airport’s International Arrivals hall. We were there to collect my father-in-law returning from the Middle East where he had visited family. Traffic en-route had been light, so we had time to wait for the landing, customs checks and baggage release before he came through the gate. As we waited, it was fascinating to observe those standing around the barriers. Each one actively scanning every arriving passenger to see if they were the party they had come to meet. Among those waiting were dozens of welcomers holding up notices on which were displayed the name of their passenger of interest. For some this was paper, others card, a couple in the shape of a car – presumably they were chauffeurs. One even displayed their passenger’s name on an electronic tablet. However names were displayed, each offered the same message of welcome and assurance, and undoubtedly each was hopeful that the person would turn up, would see them, and was paying attention! We were all there for the same purpose, we were waiting. Yet for so many, the person was unknown and the welcome uncertain and impersonal. I thank God that he didn’t have the same uncertain welcome for us. There is no uncertainty. He knows everything about us; not just how we look after a long journey and no sleep, but how we think and all we have ever done. His welcome is personal; but even more remarkably, he didn’t ask us to come to find him. At that first Christmas 2000 years ago, he came to find us. Though his own creation was living far from him, he was the one who did something about it. God sent his Son Jesus to reach out to us by journeying to our neighbourhood. We have just begun the season of Advent, which means ‘coming‘ or ‘arrival’. This is the season in which we prepare for Jesus. These are the days in which we wait with expectation and anticipation, looking back to that moment Jesus came through the arrival gate of history to meet us, to greet us, to save us. This is also the time in which we wait with anticipation for his coming again. One day he will return in glory to begin his eternal kingdom. During Advent we reflect on his coming as Emmanuel (God with us) but also there is an invitation to be ready for his return with all the consequences that will bring. Welcome to Advent. This is the time to make our preparations. This is when we take time to remind ourselves and reflect on what Jesus coming really means for me. As we go through these next few weeks together, how ready will you be to welcome the Saviour on Christmas Day? If on 25th December Jesus came through a spiritual arrival gate, what would be written on your sign? Let’s get ready to welcome the Saviour of the world!